Time spent outdoors with a parent or caregiver can contribute to the mental and physical health of a child. The benefits of outdoor activity cannot be over-rated. Sunshine and fresh air boost the child’s immune system. Contact with the beauty of nature can prevent boredom and lethargy. Many babies begin walking around nine months of age but are not ready to spend hours running around in a park or playing in the backyard, as older children do. These toddlers can benefit from being placed in an outdoor baby swing and gently swung by an adult. Baby and toddler swings offer little ones the joys of swinging alongside older siblings and being part of the family fun! Choosing the best baby outdoor swing can be a fun and interesting challenge for a parent. What swings type for baby aged 9-36 months? Choosing an outdoor swing for your toddler depends on how much back support he/she needs. If the child lacks the ability to use a belt-seat swing, bucket-seat swings may be the best choice. 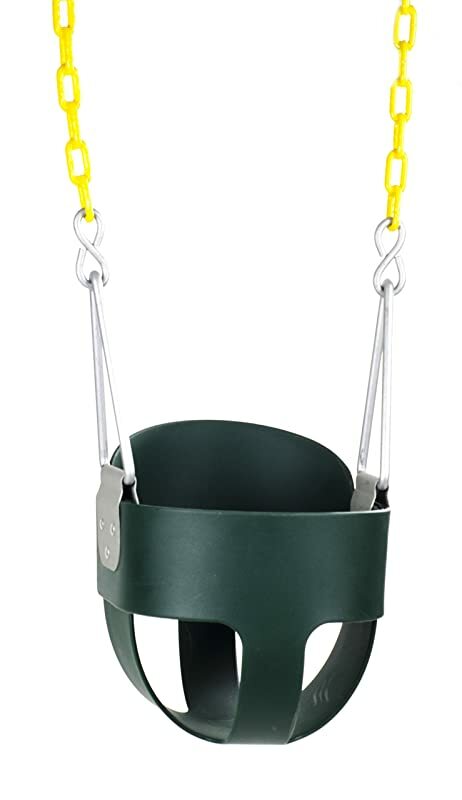 Bucket swings come in full-support style, with a high back for support and a vinyl seat that wraps around, protecting the child from falling out at any point, front or side. Some models have an open front with a tray or chain across the front for older toddlers. Bucket-seat swings come in several bright colors, such as blue, red, pink and yellow. They have chains of varying lengths and some have a plastic coating to protect little hands from injury. Bucket-seat swings can be purchased fully assembled and ready to use or seat-only to be attached to existing swing structures. 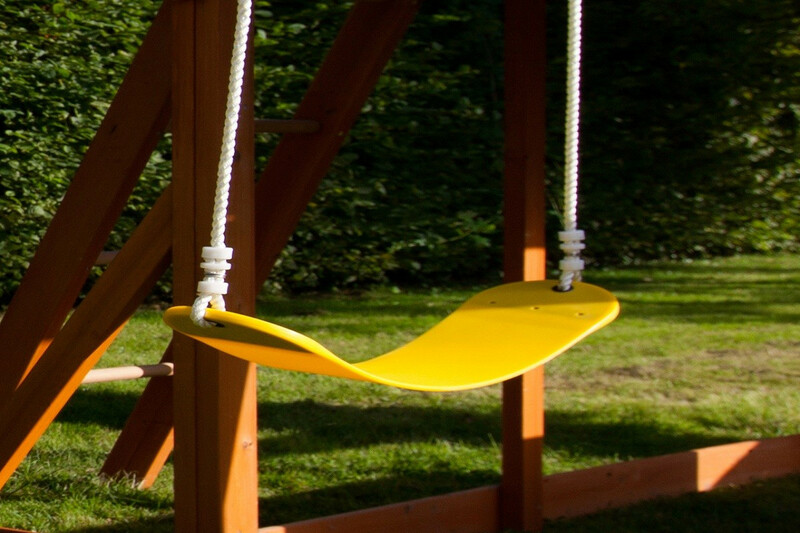 Disk swings come in various sizes to accommodate one child or several swinging together. They have been referred to as ’round swings’, based on the circular design. The disk swing consists of the disk with a sturdy rope attached through the center. This rope is wide enough to fit comfortably in the child’s hands and durable enough to withhold a great deal of wear-and-tear. Disk swings allow children to swing in the usual back-and-forth pattern or spin around in a semi-flying motion. Glider swings are a favorite of children of all ages. Usually made of sturdy plastic combined with plastic-coated chains, gliders are made to last. A four-point harness provides safety for the toddler and peace of mind for the parent. Gliders come in endless shapes and sizes, so shopping for the ideal swing will be anything but boring! For the younger set, gliders with a more enclosed shape are available for support. For older children, more open gliders allow for freedom of movement as they pump the swing to go higher. Gliders come in double-seat style for shared fun, some with seats facing in opposite directions. Installing is quick and easy. Gliders can sometimes be installed in the same attachment set-ups as belt swings. Belt swings are often considered the classic favorite of children everywhere, on the playground or the backyard swingset. The belts are usually made of commercial-grade rubber that is tough and durable. Because belt swings are open, with a comparatively narrow seat, they are best for children 4 to 13 years of age and older. Children in this age range can be seen making a mad dash for the belt swings in any park, jumping on and pumping arms and legs to see how high they can swing. Some people never outgrow the thrill of swinging, and it is not uncommon for parents to swing with their children. Belt swings are economical and versatile. They can be alternated with glider or bucket-seat swings as needed. Chain lengths vary from five to eight feet long, with the bottom portion usually being plastic covered for safety. Spring clips and S-hooks are needed for installation of belt swings. Because children from 9 to 36-months-old need more body support than children four years of age and older, the best baby outdoor swing for them would be designed to require adult assistance in getting the child into and out of the swing. Some good choices would be the bucket swing (any style), the glider swing, and the infant-to-toddler swing. Gliders might be better for children in the 24-to-36 month range than those less than a year old because improved back control would allow them to deal with the twisting and turning of these swings better. Younger children could use these swings, however, by using a slower speed and closer adult supervision. The high-back swing for babies is made for home use instead of public playground use. In just minutes, one belt swing on your swing set can be removed and a bucket swing installed using the existing hardware. If permanent installation is desired, a heavy-duty hanger kit may be purchased, such as the one supplied by Squirrel Products. In addition to the durable, roomy seat, the swing includes galvanized attachment hardware that holds up to rainy weather without rusting. 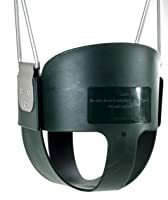 Also included are two 66-inch chains (which can be adjusted to your needs), with plastic coating on the bottom 30 inches to protect the toddler’s hands from pinching and the effects of cold weather. 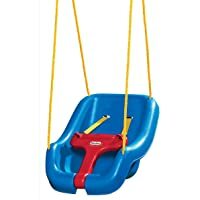 Little Tykes has provided a sturdy toddler swing that is ideal for the younger set (under one-year-old) as well as the growing toddler (up to 50 pounds). This swing is made of durable plastic and can be used for indoor or outdoor fun. It is available in a variety of colors. The 2-in-1 swing has ropes for attachment. The ropes can be adjusted to make the swing seat recline for use with the younger babies. Ropes are reported to be about 3 feet long. If more length is needed, extra rope or plastic coated chain can be added for more length in hanging the swing. Easy to install hinged T-bar attaches to shoulder straps to hold your baby/toddler securely in place. When the child no longer needs the straps, the T-bar can be secured in storage position underneath the swing. 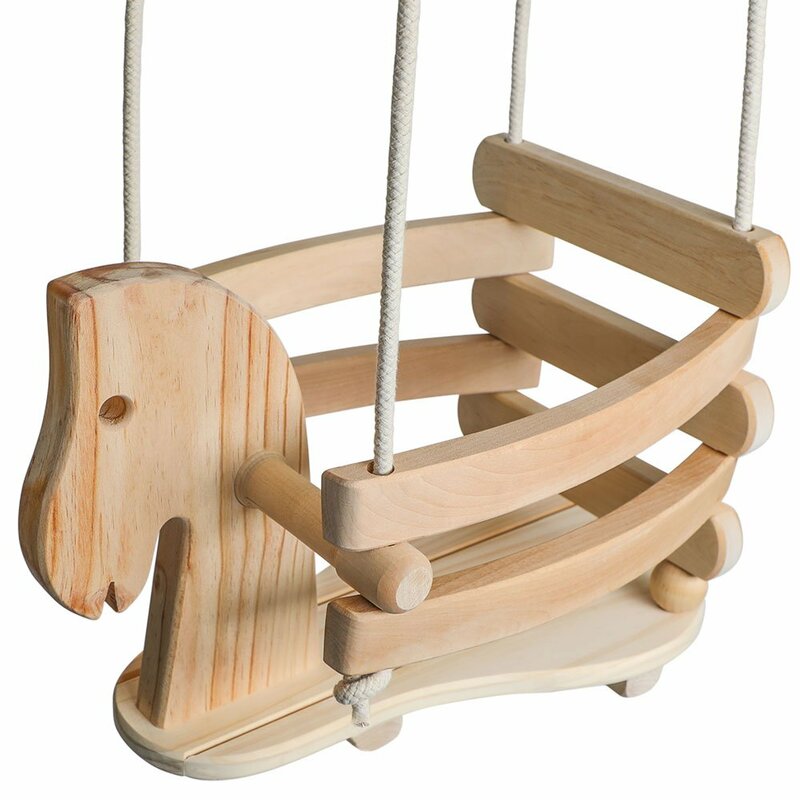 This swing is made of smooth birch wood and all-natural cotton ropes for a chemical-free product. Crafted with care and tested by the U.S. Children’s Product Certification guidelines, your swing is guaranteed for child safety as well as hours of imaginative fun. The swing is designed for babies and toddlers from six months to three years of age. Recommended weight limit is 44 pounds. Placing a child in the swing is easy; guide the little one’s feet around the bottom of the seat and help him/her sit down. The secure sides will hold the child in place while they hold onto the handlebars and “take a ride”. 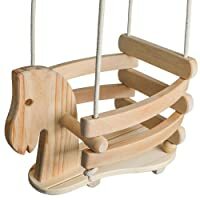 Your wooden horse swing will come packaged in a reusable drawstring bag made of calico. The bag can be used for storage needs or as a shopping bag. Everything needed for easy-to-follow assembly comes in the package, including ropes, clips, screws and steel rings. The swing can be hung from a hardy tree limb, a porch beam, or even inside the house. Of course, it is compatible with most outdoor playsets as well. The first consideration in buying an outdoor baby swing must be SAFETY! A sturdy 3-point-harness system is necessary to prevent injuries. The harness should be partnered with safety straps that are durable but do not pull down on baby’s shoulders. Most shoulder straps have some elasticity for comfort. An alternative choice would be to purchase a full bucket swing. Ropes or plastic coated chains are desirable for protecting little fingers from being pinched. Most bucket swings are made of nonreactive plastic to prevent allergies. All parts of the outdoor swing need to be weatherproof to maintain strength and comfort. Decide how many entertainment features you want your baby to have while swinging. Swings come with trays to hold toys and/or finger foods. Some swings have musical features to help entertain the child. Baby swings do not require a major monetary investment. Some are in the $50-75 range, while others are under $20. Try to find out what extra expenses will be involved, such as additional hardware, that you need to factor into the price. Are you shopping for something to include in a yard sale five years from now, or would you prefer to buy a family heirloom? Either way, concentrate on the sheer joy of watching your child grow healthy and make memories with the perfect outdoor swing! Why is it important for children to have opportunities to play? Video & Photos credits: Amazon, Eastern Jungle Gym Swing Sets, Mike Hoffmann, SwingNSlide, Climbing Frames Australia.